The St. Louis Cardinals are in do-or-die mode, trailing the World Series 3-2 going into Game Six at Fenway Park (5:00 tonight, FOX). Once again, they are turning to rookie pitcher Michael Wacha to keep them alive. The rookie has been unbelievable in the playoffs for the Cardinals. He’s made four starts, and he is 4-0 with a 1.00 ERA. He’s given up only 11 hits in 27 innings, for crying out loud. Rainiers fans saw a bit of this in person back in May. Wacha pitched at Cheney Stadium on May 16, and he shut down the Rainiers for seven innings. This game occurred during a period when the Rainiers were really good – Tacoma went 11-5 over the next 16 games. Wacha allowed just two hits: a single to Romero in the fifth inning, and a solo home run to Poythress in the sixth. He struck out eight and walked only one. Perhaps you were there? The crowd was 4,127 – not bad for a Thursday in mid-May. I’m pulling for Wacha tonight, for one simple reason: there is nothing better in baseball than a World Series Game Seven. We’re one Wacha win away from getting that thrill. Rainiers reliever Logan Bawcom blogged about pitching on opening day in the Venezuelan Winter League. Good stuff. Sorry ladies – the third-most-famous* ex-Rainiers player in the Major Leagues is now engaged. Congratulations, Adam! 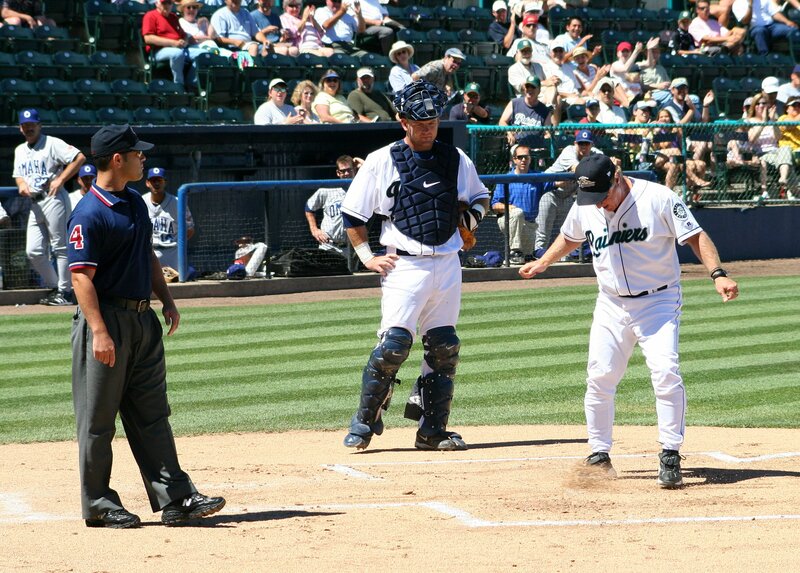 Add former Albuquerque Isotopes manager (and former NL All-Star) Tim Wallach to the list of Mariners manager candidates. It sounds like Jack Z is holed up in an Arizona hotel room, interviewing people. In The New Yorker, former Sacramento and Iowa second baseman Adrian Cardenas writes beautifully about quitting baseball. Want to be a Major League broadcaster? All you need to do is get the Pawtucket radio job and you’ll be in the big leagues in no time! I take back anything even remotely negative I may have said, written, or thought about the El Paso Chihuahuas. They’re off the hook, because we now have the Akron RubberDucks. (yes, one word, with a capital letter in the middle of course). My condolences to Eastern League broadcasters. When we next update the blog on Friday we’ll have a World Series champion and the “Hot Stove League” will be underway. * I rank the two most famous ex-Rainiers in the big leagues as A-Rod and Felix. Note that I wrote famous, not best or popular. ** Sarcasm alert! The majority of the Rainiers Front Office is sales people, who actually work harder in the off-season than during the season! This is shaping up to be a memorable World Series, if not the most well-played one. In case you missed it over the weekend, Game Three ended on a rare baserunner obstruction play (the diving third baseman accidentally tripped the runner trying to score), and then Game Four ended with a runner picked off first base with the tying run at the plate. Add to that a lot of sloppy infield defense along the way, and this hasn’t been the most aesthetically pleasing World Series. However, it has been tense – and it is lining up for a potential thrilling finish. Our lone ex-Rainiers contributor has had a slim role so far. Boston’s Mike Carp is 0-for-2 in the World Series, with an RBI. Game Five is tonight at 5:00. Seattle Times columnist Larry Stone attended Game Four in St. Louis yesterday – here’s his story. Jon Heyman reports that the Mariners have interviewed San Francisco Giants bench coach Ron Wotus for the manager opening. It appears that the Detroit Tigers are interviewing a lot of the same manager candidates as the Mariners. A handful of Tacoma Rainiers players are playing Fall/Winter baseball, and seasons have begun. Leagues range from the Arizona Fall League (played in spring training stadiums with scouts often out-numbering fans in attendance) to the Venezuelan Winter League (played in front of tens of thousands of passionate fans and nationally televised). We’ll look at where players who appeared for Tacoma in 2013 are playing. Additional players may join the Dominican or Venezuelan leagues later, as those teams are trying to win championships for their fans and often make in-season roster adjustments. The Mariners contingent includes 2013 Rainiers Stefen Romero and Brandon Maurer, with potential 2014 Rainiers Chris Taylor, Kyle Hunter, Dominic Leone, and Carson Smith. They all play for the Peoria Javelinas, in the Mariners spring training park. Romero is off to a tough start, going 4-for-32 with 10 strikeouts so far. That just doesn’t seem right; I expect him to start hitting real soon. Maurer has made three starts and posted a 3.72 ERA. This is a hitter’s league and that is not bad. Note that in the AFL, starting pitchers often toss only three or four innings because there are a lot of guys who need to get work. Maurer has thrown 9.2 innings in three outings. Three members of the Rainiers are already playing down there. Carlos Triunfel and Hector Noesi are teammates with Tigres del Licey, and Jonathan Arias pitches for Leones del Escogido. I wrote this last winter, but Triunfel has trouble getting playing time because the shortstop position is stacked down in the Dominican (many established major leaguers who are Dominican play for their hometown teams in the winter league). He’s been in three games and is 0-for-4. Noesi made one start and dealt, allowing one run in five innings. Arias has one relief appearance and it did not go well. This is where many Rainiers play, mostly due to the Mariners relationship with the Cardinales de Lara. The Mariners have been sending advanced players down there for years now, and the relationship is very strong – in fact, the Cardinales owner and General Manager visit Cheney Stadium every August to talk to players they are interested in, and to answer questions the Americans have about playing down there. It shows a lot of commitment on their part. So far, only two American players from the Mariners have ventured to Venezuela: pitchers Logan Bawcom and Anthony Vasquez. One of their teammates is native Venezuelan Jesus Montero. In the league with a different team is Rainiers catcher Jesus Sucre, who is playing for Caracas. Bawcom has appeared in five games already, posting a 2.08 ERA and nailing down a save. He’s working to refine his command while pitching in pressure-packed, uncomfortable situations down there. He blogged about his travel to Venezuela earlier this week (scroll down to Wednesday’s links), and hopefully he’ll write about the baseball experience later. Vasquez is recovering from brain surgery – a remarkable story – and has made three starts, going 0-2 with a 7.71 ERA. This is a big winter league season for Montero, who barely played in 2013 due to injury and suspension. He’s playing strictly first base and is hitting .265 with one homer in eight games. A big winter in Venezuela would be huge for Montero, who needs to get back on track offensively. We’ll check in on these guys again later in the winter. Larry Stone has a column on the Mariners manager search. The Mariners interviewed former Portland Beavers manager Rick Renteria for the opening, Greg Johns reports. From this transactions log we learn that the Mariners re-signed would-be minor league free agent LHP Nick Hill, who is a strong candidate to be in the Rainiers bullpen in April. Shannon Drayer caught up with 2013 Mariners first round draft pick DJ Peterson. Former Rainiers infielder Ramon Santiago is waiting to find out if his long stint with the Detroit Tigers is over. Geoff Baker has a blog post regarding the cash value of the Mariners, if you are into that sort of thing. Lacking that kind of dough, I find myself uninterested. If you have a Baseball America subscription, you can read their “Mariners Draft Report Card” right here. Also at Baseball America but not requiring a subscription, their business columnist has a blog post on the El Paso Chihuahuas and similar team names from around Minor League Baseball. Here’s an entertaining piece on the Chihuahuas and other PCL team names. Momentum continues – thank goodness – for a new ballpark in Nashville. Congratulations to longtime Omaha manager Mike Jirschele, who was added to the Kansas City Royals major league coaching staff today. He managed in Omaha for 14 years! Enjoy the World Series, it’s shaping up to be a good one. The new PCL team in El Paso went and did it yesterday, officially announcing that their team name is the Chihuahuas. The Rainiers will play the little dogs 16 times in 2014. I’m not so sure about the name – it’s going to be difficult to say on the radio with a straight face. However, the logo is quite good, and they are going to sell a ton of hats. Check out this gallery of Chihuahuas images. I read through the El Paso Times news stories on the name choice and reactions was… mixed. See for yourself with this story, and a round-up of comments that were made on Twitter. Former PCL broadcaster Brett Dolan jogged my memory when he wrote on Twitter that Chihuahuas reminded him of when a new Midwest League franchise in Battle Creek, Michigan named itself the Battle Creek Golden Kazoos. Response was swift – they changed their name before playing their first game! After running through several entities, that team now has a magnificent name: the Great Lakes Loons. That’s not going to happen in El Paso. They made a big production of the Chihuahuas name, and management is referring to “the Chihuahuas brand” in interviews. From El Paso, we have a photo gallery of the announcement. Lots of people on hand – a successful franchise down there will be good for the league. John McGrath wrote a column about the World Series. Game One is tonight at 5:00 on Fox. The Mariners continue their manager search, reportedly interviewing A’s third base coach Chip Hale today. Former Mariners major and minor league pitching coach Bryan Price was hired to managed the Reds yesterday. Congratulations to a great guy who spent lots of time at Cheney Stadium. Local guy Tim Lincecum signed a two-year contract extension with San Francisco, rather than test the free agent market. I believe the Mariners would have been interested if he was on the open market. That winter leagues update I was going to post today got bumped to Friday (“postponed due to Chihuahuas”). In the mean time, check out this great blog post by Rainiers reliever Logan Bawcom on his experience so far in Venezuela. I enjoyed this selection of ten great World Series program covers from the past. * Can’t wait to see how the Cheney Stadium scoreboard operator shortens Chihuahuas to make it fit in the allotted space on the line score. The World Series is set – it will be the Boston Red Sox against the St. Louis Cardinals, starting in Boston on Wednesday night at 5:00 (FOX). There is a modern rarity here: the two teams with the best record in their respective leagues during the regular season advanced to the Word Series. This used to happen all of the time, but now that there are three rounds of playoffs with wild card teams it has become rare. The last time the two teams with the best regular season records reached the World Series was 1999, when the Yankees played the Braves. Boston’s Mike Carp will be the lone ex-Rainiers player in the World Series. He’s been coming off the bench during the playoffs – perhaps the NL-style games in St. Louis will create some additional opportunities for him (pinch-hitting for the pitcher, or subbing for Big Papi at first base). This is the 1,000th blog post since the Rainiers encouraged me to start writing this thing on February 8, 2010, and we’ve had nearly 600,000 “views” with readership increasing each year. Three posts from the past continue to get regular hits from search engines: The Felix Call-Up Story, The Simpsons At Isotopes Park, and Keeping Score. Thanks for reading all of this time. We’ve survived a blog name change, foul balls nearly destroying the laptop I use to type these posts, poor grammar & myriad typos, and we’ve only been threatened with one lawsuit (so far). We intend to keep the blog going, thanks to you – so save that bookmark! CBS national baseball writer Jon Heyman spoke with Eric Wedge and tried to get some clarity on why he walked away from the Mariners. Bizarre story out from the Seattle Times news department, regarding some wire fraud between the wives of a current and former Rainiers player. Ryan Divish shared his thoughts on both of the previous stories. It was Daren Brown‘s turn to be featured in that massive “Greatest 21 Days” blog project. Check it out for the picture of a young Brownie if nothing else. On Wednesday we’ll have a new post checking on Rainiers (and potential Rainiers) playing in the Winter Leagues. The outstanding League Championship Series continued last night, with Detroit evening-up its series against Boston behind the pitching of former Rainiers right-hander Doug Fister, and the Dodgers staying alive with a game five win against St. Louis. I was able to watch a good portion of the Fister game, but I missed all of the Dodgers-Cardinals game. And according to someone who watched it, I missed a rare Dan Rohn mention. According to my friend, the announcers were talking about Brian Wilson‘s lengthy beard and the last time he shaved. They said that the last time Wilson shaved, it was because Dan Rohn made him. Rohn managed the Rainiers from 2001 through 2005, then moved on to Fresno and managed Wilson in 2006 and 2007. The later year was Wilson’s final as a minor leaguer, and when the manager asked him to shave, he had to do it. Last I heard, Rohn was living a semi-retired life in Traverse City, Michigan. Hey, we have an opening! Rohn made players shave and umpires clean plates. How’s that for a misleading title? You thought I was going to tell you how the Mariners manager search is going, or who Tacoma’s manager will be next year, didn’t you? But we do have some manager news in the PCL. First and foremost, the only manager in the history of the Reno Aces is moving on. The Miami Marlins hired Brett Butler to be their third base coach next year. Butler was the Reno manager from their first season (2009) up through this year. He even has a bar at the stadium named after him, called “Bugsy’s.” I suppose it could be named after Bugsy Siegel, but I prefer to believe it is named after brett “Bugsy” Butler. I enjoyed interviewing Bugsy a couple of times each season for the pregame show, he was always available and very forthright. Best of luck to him in Miami. Also on the manager front, former Seattle Mariners outfielder Darnell Coles was named manager of the Nashville Sounds late last week. Coles was the Mariners first round draft pick in 1980, and he reached Seattle in 1983. He was an up-and-down guy for three years with the Mariners before blossoming after (stop me if you’ve heard this before) being traded to Detroit. He was a starter for a couple of years in the majors, but was able to hang around for a long time as a fourth outfielder. Cole had been working as a hitting coach in the minors, but two years ago he got the Brewers Double-A manager job, and they just promoted him to Triple-A for 2014. I look forward to interviewing Coles when we play Nashville this year. Gotta ask him what it was like being traded for Rich Monteleone. Brett Butler talked to the Reno newspaper about his decision to go to Miami. The Nashville Tenneseean has a few notes on Darnell Coles. Baseball America has its Top 20 Prospects from the PCL now online. The list is free (at the bottom-right of this link), but the good stuff is in the scouting reports which require a subscription. Today is the 25h anniversary of Kirk Gibson‘s limp around the bases. If you have some time to kill, enjoy this oral history from ESPN. You are currently browsing the Booth, Justice and the American Pastime blog archives for October, 2013.